This morning on My Pink Stamper, guest designer Kimmy shared a cute project and a link to RGB codes for Papertrey Ink. As you may have noticed, I am a huge PTI fan, so I couldn't wait to try these out on my Imagine. I cut the pumpkin shape that comes with the Imagine at 1" and 1 1/2", using the codes for Orange Zest and Terracotta Tile. Although they didn't come out as perfect matches, I think they do coordinate well with the PTI papers. The 2" wheelbarrow is from Walk in My Garden, and is also cut out on the Imagine, using the codes for PTI's Ripe Avocado and Dark Chocolate. 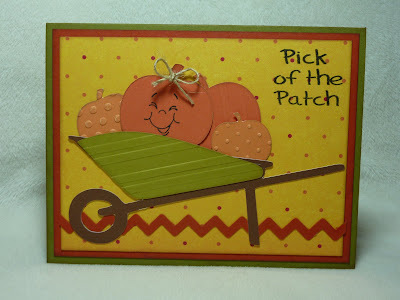 "Pick of the Patch" is from My Pink Stamper's Spooky Puns stamp set (click here for ordering information). 5 1/2" x 8 1/2" PTI Ripe Avocado Cardstock, scored at 4 1/4"
Such cute pumpkins!The embossed pumpkins gives it a little extra! Brand New My Pink Stamper Stamps!